National Bike Month has been recognized since 1956. The 3rd Friday of May is declared as the national Bike to Work Day celebrating cyclists who commute to work. The Third Week of May is designated as Bike to Work Week. With over 50% of US population living within five miles of their workplace, riding a bike to work is practical and saves money. The perpetual summer weather we enjoy makes getting to work by riding a bike on Maui even more practical and avoids the high cost of gas and maintenance. Do you bike to work on Maui? Share the details about your Maui bike commute in the comments section. In 2012, more than $4.6 billion was saved by Americans bicycling instead of driving. Trips of Less than 3 miles are faster by bicycle. Ride a bike on Maui to avoid generating the 3.6 pounds per mile of pollution short auto trips generate. $308. is the average cost of annual bicycle maintenance. $8000. is the average annual expense for an automobile. Save time and avoid parking fees in Lahaina by riding a bike. Ten bicycles will fit in the average auto parking space. Fortunately, you’ll find plenty of bike racks in Lahaina, Kaanapali and most other Maui locations. An average bike commuter travels at 10 mph. Use Your Work Commute to Exercise. On average, a 130 pound woman burns 300 calories on a 10 mile round trip bike ride while a 180 pound man burns 400 calories over the same 10 mile cycling route. All Maui County buses permit bicycles with storage for up to two bikes in front of the bus. Check your route and use the bus for if any parts of your bike commute you don’t want to ride. Most roads on Maui have a wide shoulder or berm suitable for riding a bike for sightseeing or commuting on Maui. Our Maui Bike Rentals begin as low as $15. a day for a beach cruiser bike. Performance road bike rentals are $60 a day. Most economy car rentals on Maui begin at over $50 per day plus fees and gasoline expenses. If you used your bike to get to work on Maui on Friday, May 17, 2013, we’ve got a new West Maui Cycles bike water bottle for you! All you have to do to claim the water bottle is post a picture to our Facebook page. Make sure the picture includes yourself with your bike outside of a local workplace after you ride to work on Maui. Then, stop into the bike shop in Lahaina, identify yourself in the pic to claim your new bike water bottle. Or, if you are a Maui visitor and use a bike to commute to the beach, you may use a photo of yourself alongside one of our West Maui Cycles rental bikes at the beach you commuted to on May 17. Either way, all images must be posted to our Facebook page before the end of May, Bike Month on Maui. If we organized an event for next year for bike to work day or bike to work week, would you participate? Let us know in the comments section below. If we have enough interest, we’ll try to organize an event for the 2014 National Bike to Work Day. Would you ride with the mayor or attend a breakfast bike ride and rally for National Bike Month? Thanks to the BikeLeague.org website for some of the details and info about the National Bike Month. Soon after arriving at the bike shop in Lahaina (West Maui Cycles) and beginning the day getting a few island bike rentals out to riders picking up bikes, I answered a phone call. The caller arrives on Maui this Saturday and is planning a few bike rides during her Maui bicycle vacation. Being an avid road bike rider, she had already made her online bike rental reservation for our Specialized Performance Road bike rental to enjoy a week of bike touring on Maui. She suddenly realized she’ll be here over Valentine’s Day and had not planned on riding with her fiancé. Now, she wanted to spend Valentine’s day with her fiancé and was calling to inquire if we rent bikes suitable for an inexperienced bike rider in good condition. She also asked if I had any good ideas for fun bike rides on Maui, where she and her fiancé could enjoy a romantic valentines day togethor touring Maui by bicycle. I thought for about a half a second before recommending she rent our Electra HellBetty tandem cruiser for a morning of leisurely riding in Lahaina. Since their accommodations are in Kaanapali, the bike shop in Lahaina will be easy to get to and a good point to begin their day of bike riding on Maui after picking up their rental bike. I suggested riding the Electra HellBetty tandem into Lahaina Town for a leisurely cruise on Front Street followed by a mid-morning breakfast at one of the charming restaurants in Lahaina. Since we include a lock with our bike rentals, it will be easy to secure the bike rental while enjoying breakfast. After exploring Lahaina by bicycle, they’ll come back to the bike shop to pick up a couple Specialized Hybrid comfort bike rentals. For the second half of their fun day of bike riding on Maui, I suggested the Lahaina to Olowalu Petroglyphs bike ride. The bike ride to the Olowalu petroglyph is approximately 6.3 miles and another mile or so of easy off road trail riding to and from the petroglyph. I recommended a stop for lunch at Leoda’s Sandwich and Pie Shop in Olowalu before returning to the bike shop to drop off their hybrid bike rentals in Lahaina. What is your favorite romantic bike ride? Does riding the red Electra Hellbetty tandem bike rental on Valentine's day sound like a romantic bike vacation? Let us know in the comments section below! Or, subscribe to keep up with the latest Maui bike news! 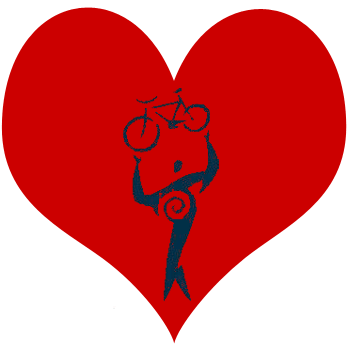 Surprise your valentine with Maui rental bicycle reservations made via our online bike rental reservation system. Need romantic gifts for bike lovers? Order West Maui Cycles cycling jersey and other Maui bike logo wear from our online bike shop. Our bike shop in Lahaina stocks a huge selection of bike parts and bicycle accessories to prepare your bike for riding on Valentine's day! From tubes and tires to bicycles for sale, our Maui bike shop is stocked with a complete selection of bicycle parts and accessories. If you don’t feel like servicing the bike yourself, maybe a bike tune-up from our bike repair shop would be perfect bike lover gift on Valentine's day? Gift certificates are also available and make a thoughtful romantic gift for Valentine's day.